This topic contains 1 reply, has 2 voices, and was last updated by Anonymous 5 years, 4 months ago. CCTV Camera Pros recently had a customer ask how to configure iPhone, iPad, and iPod touch mobile devices to connect directly to a Zavio IP camera without using a wireless access point or wireless router. This is possible by setting up an ad-hoc network (also known as a peer-to-peer network) between the wireless security camera and the iPhone. 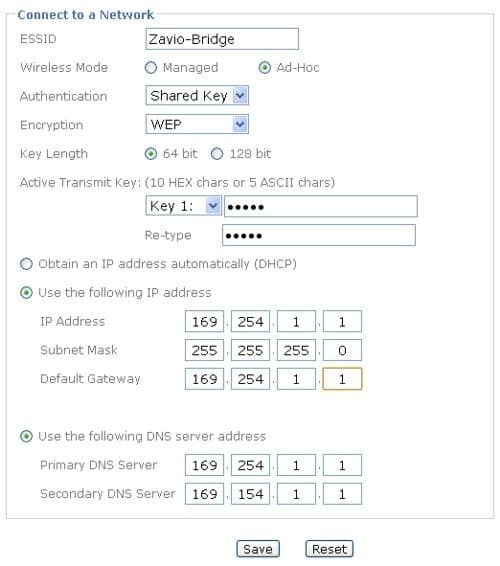 The below instructions document how to setup the direct wireless connection between a Zavio F7210 HD surveillance camera and an iPhone, but the same instructions can be followed and used to configure any Zavio wireless security camera. Note: The Zavio F7210 supports wireless only by adding the optional USB WIFI dongle, so if you are using these instructions for this model, start by inserting the wireless dongle into the camera. Login to your IP camera from a web browser. Click on the configure button (the button in the upper left with the hammer & screwdriver). Click Basic Setup > Network. Click on the WLAN tab. Select Enable from the dropdown. Click on the Manual button and enter the following settings. Note that the Key needs to be 5 characters in length if you select 64 bit key length. Configure your iPhone, iPad, or iPod Touch to connect directly to the ad-hoc network. Tap on the Settings icon in your iPhone or iPad. 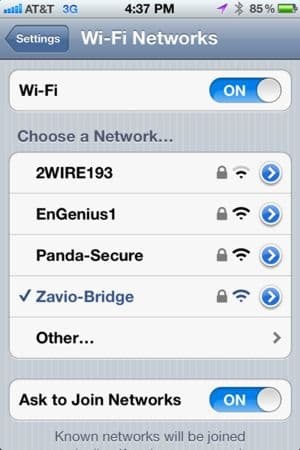 Make sure a check mark is visible before your ad hoc network name (Zavio-Bridge). Click on the Static button and fill in 192.254.1.2 for the IP address, 255.255.255.0 for the Subnet Mask. You can now close this configuration screen by pressing the home button on your iPhone or iPad. You will be prompted for the username and password of your Zavio camera. If you have not changed it, the default username is admin, the default password is admin. You should now see a live view of your camera. I did the above procedure for my Zavio F3115 camera and my iPad and it worked fine. Is it possible to connect a Zavio camera directly to an Android device (Wi-Fi Direct)? Any trick?